He didn’t know it at the time, but when chemist Matthew Todd posted a request for help on The Synaptic Leap, a website devoted to open-source biomedical research, he was sowing the seeds for a rivalry between an open initiative and a contract-research organization hired by the World Health Organization to reach the same goal. Packets of cannabis seeds line the shelves of legal grow shops in Madrid. Many carry labels reporting the percentage of sativa and indica, two types of cannabis. Breeders often label plants that produce a more exciting high as sativa and plants that provide a more mellow feeling as indica, suggesting that cross-breeding tailors that buzz. The conceit is widespread. Botanist Jonathan Page at the University of British Columbia in Vancouver, Canada, says he sees the same at local grow shops. For reasons that go beyond assessing the quality of the user experience, botanists such as Page are investigating the evolution and present-day diversity of cannabis. To do this, they must confront centuries-old taxonomic questions, including whether cannabis is one species, Cannabis sativa, with several subspecies or varieties, or if it is several distinct species, such as C. sativa, Cannabis indica and Cannabis ruderalis. “It’s complicated taxonomically because of its intimate relationship with humans for long periods of time,” Page says. People have long bred cannabis as a source of fibre, food and oil — as well as for its mind-altering effects (see page S10). As governments relax cannabis laws, commercial growers want more clarity about the chemical properties and capabilities of the herb’s many varieties. In parallel, regulatory bodies trying to establish a legal framework want to be able to classify whether a given type of plant is for fibre (hemp) or recreational or medical use (marijuana). In a green field outside Madrid, at the foot of the snow-covered Guadarrama mountain range, lies a sun-faded snail shell. 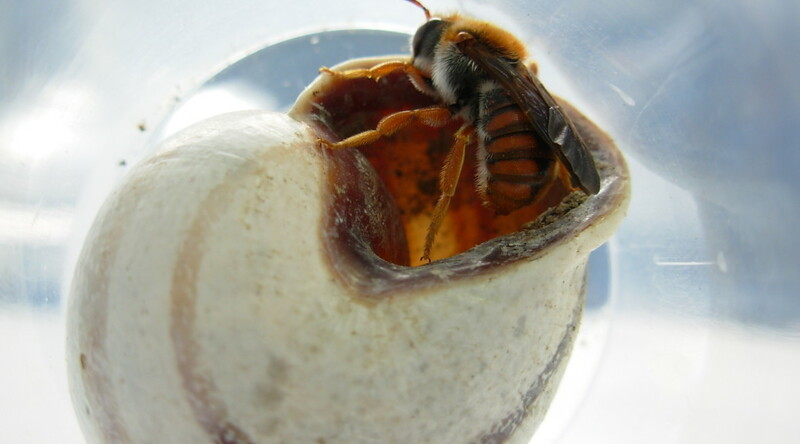 Its opening sealed with a cap of dried mud, the shell contains the larva of a wild, solitary bee, together with its first meal of bee bread — a mixture of pollen and nectar. Entomology graduate student Daniel Romero picks up the shell and, concluding that it contains the nest of a mason bee, stores it in a clear plastic tube, labels the red cap with a marker, and closes it. Back at the Complutense University of Madrid, Romero sets ten tubes of the nesting bees he collected on his professor’s desk. They are just a fraction of the hundreds of samples that he and his colleagues will gather during a four-year Spanish government-funded study of how artificial chemicals are affecting the biodiversity of wild pollinators and their immune and reproductive systems. In the warmth of the office, some of the young adults twitch and scratch at their now-crumbly mud doors. Researchers watch the young adult bees slowly emerge into their new world. When the air cools and the humans leave the room, the bees return to their pollen pillows. Unlike honeybees, solitary bees buzz to their own drum. See an album of photos I took while reporting this story. 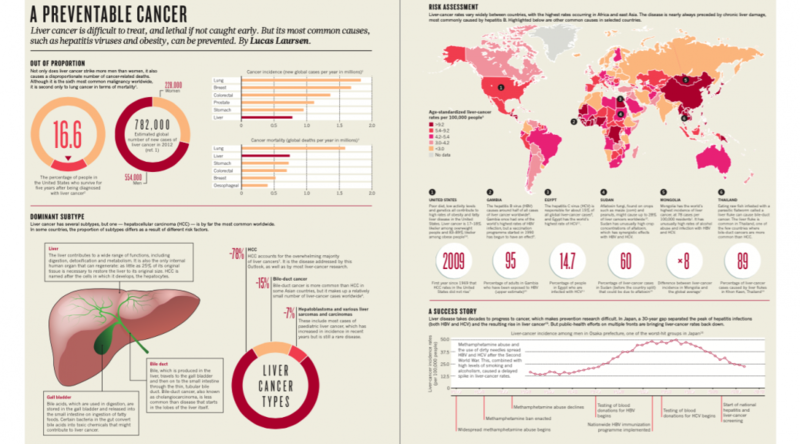 I reported and wrote an infographic on the epidemiology of liver cancer. It was a good growing experience to work with a designer and an editor on a piece of visual, data-oriented journalism. I learned a lot and ended up wanting to experiment more with conveying data visually, with words and stories as a complement, rather than the other way around. I’m looking forward to the next opportunity. To best see the visual elements of the infographic, I recommend checking out the PDF below rather than the HTML web version. First published by Nature Outlook: [html] [pdf].